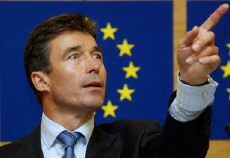 July 3, 2002: Danish Prime Minister Anders Fogh Rasmussen presents his country's agenda for its European Union presidency. Denmark, which assumed titular leadership of the Union on July 1, 2002, is expected to address the thorny subject of illegal immigration (Photo: AFP). “Are you all racists in Denmark?” read a May 22 headline in Jyllands-Posten, followed by an article on the Swedes’ perceptions of the Danish swing to the right. That seems to be the question many Scandinavians are asking following the passage on May 31 of long-anticipated new immigration legislation. Ever since Nov. 20, when a center-right coalition defeated the reigning Social Democrats, and the anti-immigration Danish People’s Party (DPP) took 12 percent of the vote, curbing the influx of asylum seekers and immigrants, who are joining their families, has been high on the legislative agenda. But Prime Minister Anders Fogh Rasmussen’s minority government was well aware that without the DPP’s 22 votes, it would not be able to pass new immigration laws. After months of closed-door negotiations, during which the DPP sought further concessions and harsher measures from the government, a compromise paving the way for the new legislation was reached in early May. Swedish Prime Minister Göran Persson pronounced that his government had deep misgivings about the new Danish asylum laws in Denmark and expressed concern that DPP leader Pia Kjærsgaard has “given Danish politics a face that we have not seen before.” Meanwhile, Sweden fears that it will have to absorb the refugee overflow created by a Danish crackdown on immigration. And Sweden’s integration minister, Mona Sahlin, warned that tightening immigration laws might present problems when Denmark takes over the six-month presidency of the European Union on July 1.